Yesterday, we took a look at the official Nexus 7 case and came away impressed by the quality, but a little less impressed by some missing features (auto sleep/wake would be one major feature missing). As one of our readers has pointed out, there are numerous options sold through Amazon, almost all of which include auto sleep/wake. 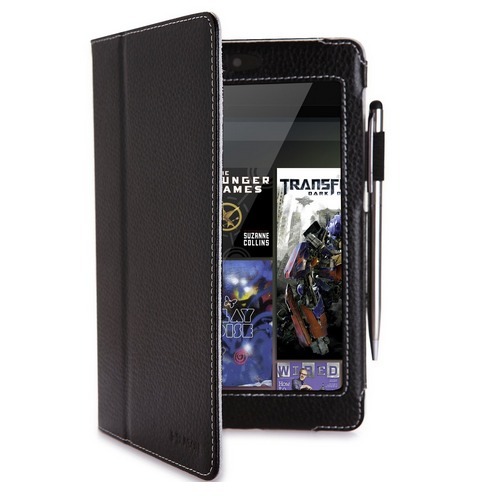 Many are made with premium leather, but some, like the i-BLASON case we have pictured above, also come with a stylus and have viewing angle support, yet manage to land at the same $19.99 price as the official TPU case. If you are dying to get your hands on a case, we have 3 options listed below, but again, Amazon has more than we can list in one post. The official TPU case looks hot with its Nexus logo, however, you may want more from a case than it can give you. The i-BLASON and Blurex also have Prime shipping available.